Amblyopia is also called “lazy eye.” It is an eye problem that starts in early childhood. Amblyopia is the most common cause of vision problems in children. It happens when one eye doesn’t work properly with the brain. The brain favors the eye that does work correctly. This causes a loss of vision in the other eye. Amblyopia usually affects only one of the eyes. Sometimes it can affect both. It is important to detect amblyopia in your child early and treat it promptly. If you do, he or she most likely will not have long-term vision problems. Left untreated, it can cause severe vision problems, including legal blindness. Eyes that don’t work together. One eye that wanders inward or outward. Squinting, shutting one eye, or tilting the head to look at something. An upper eyelid that droops. Sometimes symptoms are not noticeable except in an eye exam. All babies are born with poor eyesight. As they grow older, their vision continues to improve. For good eyesight, both eyes need to provide the same clear, focused image. Some children develop conditions that cause problems with their vision. These problems can cause the child to get a different picture from each eye. The child’s brain naturally tries to fix this problem by blocking out the weaker picture. If the problem is not fixed when the child is young, the child’s brain will always ignore pictures from the weak eye. This causes amblyopia. Strabismus (also called crossed eyes) – The eyes don’t line up in the same direction. This is the most common cause of amblyopia. Refractive error – This includes nearsightedness, farsightedness, and astigmatism. It is more likely to cause amblyopia if the error is greater in one eye. Cataracts – These cause clouding in the lens of the eye. Cataracts in children are uncommon. Have a family history of amblyopia. If you notice any of the above symptoms in your child, even when he or she is an infant, call your doctor. He or she will do an eye exam. They will ask about symptoms, family history, and risk factors. Children should start getting eye checkups between the ages of 3 and 5. Regular exams will help find problems early. Can amblyopia be prevented or avoided? Amblyopia cannot be prevented. But vision loss resulting from it can be avoided. Watch your child’s vision habits. If you have any concerns, call your doctor. Start getting your child’s eyes checked when he or she is 3 years old. Continue with regular checkups. When amblyopia is caught and treated early, children should be able to keep most of their vision. If it is left untreated past the age of 10, they will probably have vision problems for the rest of their life. Early detection is the key to preventing vision loss. Treatment for amblyopia involves the child using the weaker eye more. This helps the eye get stronger. To make the child use the weaker eye, he or she will wear an adhesive patch over the stronger eye. Most children wear their patches 2 to 6 hours a day. Sometimes, eye drops or special glasses are used to blur the vision in the stronger eye. This also makes the weaker eye work harder and strengthens it. Glasses or contact lenses can fix problems with nearsightedness or farsightedness. Surgery may be needed for cataracts, droopy eyelids, or crossed eyes. Treatment usually lasts until vision is normal, or until vision stops getting better. For most children, this takes several weeks to several months. A few children need to use eye patches until they are 8 to 10 years old. There’s a small chance that using an eye patch for too long can hurt the strong eye. Children who are wearing eye patches should see their doctor often during the treatment. The first years of life are the most important for eyesight development. During a child’s first 7 to 10 years, connections between the eye and brain are created. It is much more effective to treat amblyopia while those connections are still maturing. After your child’s vision system is fully developed, it is hard to change. If the amblyopia hasn’t been treated, he or she will most likely have poor vision for life. It won’t be possible to fix it with glasses, patching, or any other treatment. One clinical trial showed that there could be benefits for treating children up to age 17. More research is needed on how treatment could help teenagers or adults. 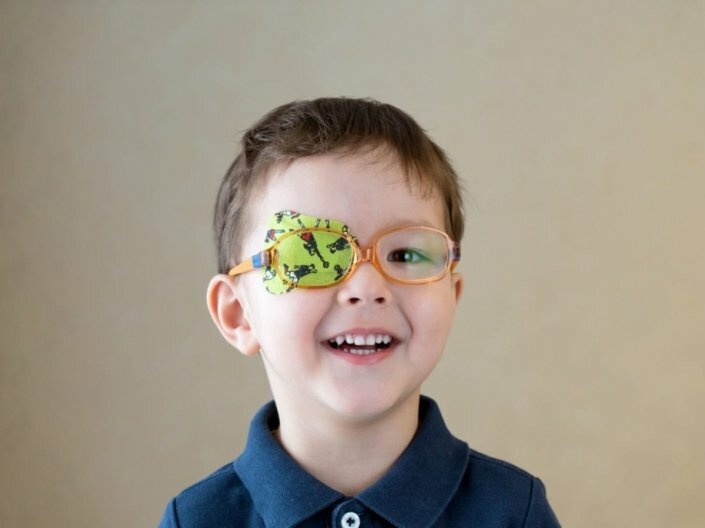 Depending on your child’s age, it could be difficult for him or her to wear an eye patch. If a patch bothers your child, ask your doctor if you have other options. Glasses or eye drops might be a better choice for your child. Amblyopia can come back after treatment is finished. It’s important to continue to watch your child for symptoms. If they do come back, treatment will need to be done again. Some children’s treatment lasts until they are 10 years old. Will my child always have vision problems? What is the best way to treat amblyopia? Will my child need glasses or contacts? My child needs to wear an eye patch. How long will he or she wear it? Are there any long-term problems from amblyopia? My child doesn’t like the eye patch. Is he or she a candidate for the eye drops?